Josh and Emily have their first hangout at the VGM Jukebox! Listen in as they chat, relax, and choose some tunes. They'll be meeting up again in two weeks, but next time they want to play tracks that you suggest! Got a tune in mind? 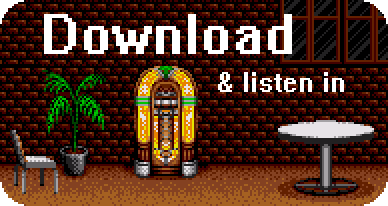 Submit a VGM recommendation here, or send us an e-mail. Be sure to drop in again on the next gathering at the VGM Jukebox. You'll be a regular before you know it. After having played Bomberman '93 on the Wii virtual console, I could not agree more with its choice as a really fun and exciting soundtrack. Also with Columns, you have to cover Clotho or Lathethis from the original Columns, those are some amazing sounds. Great start guys and keep it up! It's interesting because this track, like many of the Bomberman tracks, mixes traditional Japanese melodies with traditional-sounding melodies from elsewhere around the world. Nobody does it quite like Chikuma-san. That Columns III track is tight! Recently discovered this podcast through VGMpire and I'm really enjoying it. Thanks for putting together all these wonderful tracks.